Earth Aware Editions, 9781608879595, 40pp. Discover tranquility and peace by coloring in beautiful landscape and wildlife scenes from America's national parks based on the renowned photographs of Ian Shive. Some of the world's most beautiful and iconic landscapes are preserved within the US National Park System, and Ian Shive, a leading chronicler of America's national parks, has been capturing these vistas for years. 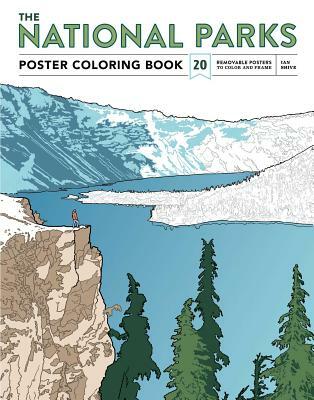 This National Parks Poster Coloring Book will feature poster-sized and styled line-art renderings of Shive's most iconic images from the national parks. A full-color poster complements the line drawings and provides inspiration from the greatest of all painters--Mother Earth. Ignite your creativity through the exploration of nature, and color your way through the National Park System. Ian Shive is an award-winning conservation photographer, author, educator, film producer, and environmental advocate, most recently recognized as the recipient of Sierra Club's 2011 Ansel Adams Award for Conservation Photography. Shive's images have appeared in publications around the world, including National Geographic, Time, Ski, Travel Channel, Gourmet, the New York Times, the Los Angeles Times, US News and World Report, Popular Science, Men's Journal, Outside, and hundreds of others. Often referred to as the leading chronicler of America's national parks today, Shive has helped shape diplomatic efforts around the world through his Wilderness Diplomacy initiative, currently underway in Afghanistan, and his best-selling book, The National Parks: Our American Landscape. He lives in Los Angeles.